Home › Construction Spanish › Jobsite Leadership › Why Obama Won the Election, How Reagan Foresaw El Futuro, and the Universal Truth. 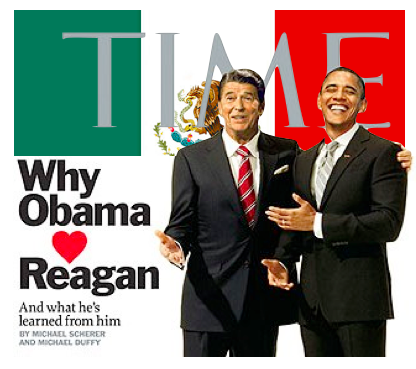 Why Obama Won the Election, How Reagan Foresaw El Futuro, and the Universal Truth. That was NBC political wonk Chuck Todd’s four-word answer on Meet The Press this past weekend. 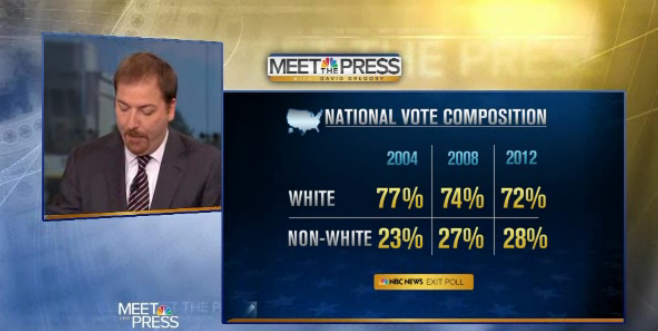 Here’s the slightly longer answer: White voters down 2%. Non-White voters, driven by the large Hispanic turnout, up 1%. Net 3%. Game over. Todd went on to present a map of the 10 states with the largest Hispanic populations. Obama won 8 of them one week ago. Todd believes Arizona will be in play in 2016 with Texas to follow soon thereafter. Guess how many electoral votes reside in these 10 states alone. Only need 270 to park at La Casablanca for 4 years. 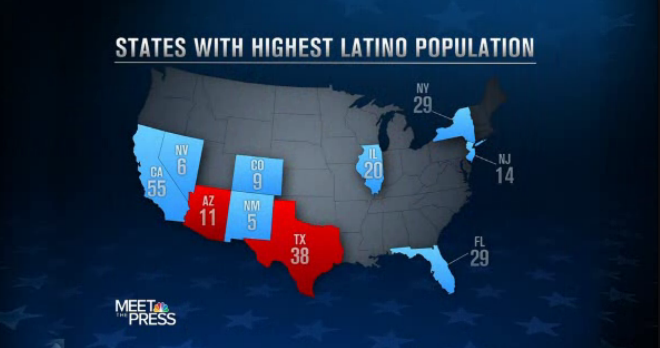 Hispanics are not a single uniform voting block. Some are conservative on particular issues, some are liberal. In the next four years this demographic will be much more politically stratified than it is now. Case in Point: For the first time in decades, a majority of Cubans in Miami voted Democrat. Third Generation Cubans may blame Kennedy for the Bay of Pigs, but they don’t blame all Democrats… at least not Obama. One issue that is uniform? Hispanics will consistently oppose politicians who push for mass deportations. Yep – More than 4 out of 5 Hispanics you’ll see today are legal. Many of them have been in the US for decades. Unfortunately, the perception I get is many think the math is reversed – that 83% are illegal. Not so. Gotta look out for Número Uno, right? 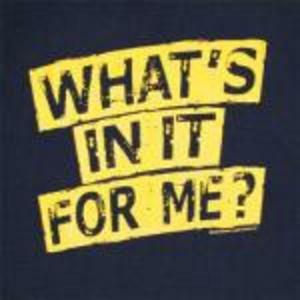 Momentum builds quickly when doing that which benefits you personally also happens to benefit others. “And it’s good to hear that Lindsey Graham and Chuck Schumer are going to start advancing comprehensive immigration reform again because we have to get this off the table as a political issue for the party. 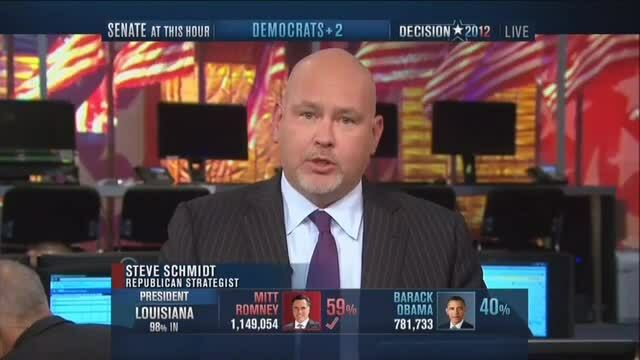 Had Romney won, do you think he’d be all for Immigration Reform? The Hispanic demographic is huge and growing. And most importantly, Hispanics understand their numbers represent power. Hispanics can determine how things are run domestically. Court Hispanics… they are 2x as likely to be injured or killed. Court Hispanics… Nearly 11M Hispanics shopped at The Home Depot once in the past month. Court Hispanics… 74% of all new jobs this decade will be filled by Hispanics. Want to decrease negative feedback? Ignore the demographics at your own peril.